Below are old news. Latest news are available on the IGL main page. Gerard Pons-Moll visits IGL and speaks at the Visual Computing Lunch. The ACM SIGGRAPH ASIA 2017 Technical Papers sort takes place at IGL. Yaron Lipman visits IGL and speaks at the ETH Zurich Distinguished CS Colloquium. Olga Sorkine-Hornung receives the Eurographics Outstanding Technical Contributions Award. We are honored to host Prof. Mario Botsch for his short sabbatical at ETH! Congratulations to Kaan Yücer on successfully defending his PhD thesis! Our paper "Depth from Gradients in Dense Light Fields for Object Reconstruction" won the Best Paper Award at 3DV 2016! Congratulations to Romain Prévost on successfully defending his PhD thesis! We have new publications available, including SIGGRAPH 2016 and TOG papers! Check out the publications page. Katja Wolff and Michael Rabinovich joined IGL. Welcome! Olga Diamanti has successfully defended her PhD thesis. Congratulations, Dr. Diamanti! We have two upcoming SIGGRAPH ASIA 2015 papers, check them out! Roi Poranne and Changil Kim join IGL. Our open-source geometry processing library libigl wins the Software Award at the Eurographics Symposium on Geometry Processing 2015! Alex (Wan-Chun) Ma joins IGL. Two new books co-authored/co-edited by Olga Sorkine-Hornung! Check out "Digital Representations of the Real World: How to Capture, Model, and Render Visual Reality" and "A Sampler of Useful Computational Tools for Applied Geometry, Computer Graphics, and Image Processing". Especially the second one took many years to write, it was started when Olga was a PhD student and contains a lot of fun and useful wisdom for Visual Computing students and practitioners. We have a bunch of new publications this year, including 3 papers to be presented at ACM SIGGRAPH 2015. Check out our publications page! Daniele Panozzo wins the EUROGRAPHICS Young Researcher Award! An open postdoc position in facial animation is available, please send your application with a recent CV to our lab address or via e-mail. Olga Sorkine-Hornung was selected to serve on the editorial board of the IEEE Transactions on Visualization and Computer Graphics journal. "Einstein" on SRF (Swiss Radio and Television) did a segment on our research, including the Tangible and Modular Animation Device! Check out the full show (in German), our part starts around 9:55. We have 2 new SIGGRAPH ASIA papers this year! Check out our publications page for more details. 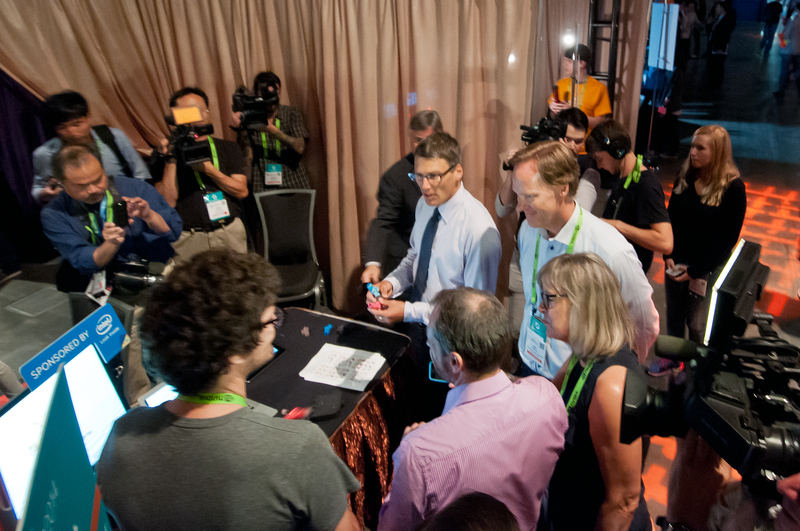 Last week at the ACM SIGGRAPH Emerging Technologies exhibition, we had the honor of presenting our "Puppet" articulation device to thousands of participants, including the Mayor of Vancouver (BC)! Here is a snapshot of the event and a media release about our project. CGAL releases a package that implements our As-Rigid-As-Possible Surface Deformation! Check it out! The source code for our paper "Content-Aware Surface Parameterization for Interactive Restoration of Historical Documents" is now available. Check it out! Our paper on Designing N-PolyVector Fields with Complex Polynomials presented at SGP 2014 has received the Best Paper award! We have 4 new SIGGRAPH papers this year, as well as two ACM TOG papers, to be presented at SIGGRAPH 2014. Check out our publications page for more details. A new, free iPad app called Animato implements our skinning method using Bounded Biharmonic Weights! The app allows users to animate their photos using an intuitive multitouch interface. Check it out at the Apple AppStore! Our SIGGRAPH 2011 paper "Bounded Biharmonic Weights for Real-Time Deformation" is reprinted as a Research Highlight by the Communications of the ACM, with a foreword by Joe Warren. Alec Jacobson wins the Eurographics Annual Award for Best PhD Thesis. The award is given to the best PhD theses in Computer Graphics in Europe. Congratulations, Alec! Tim Hoffmann visits IGL and gives a guest lecture in the group seminar. Detlef Mueller, senior manager of digital creation at Adidas, visits IGL. Check out our new EUROGRAPHICS 2014 and TOG papers! Among other things, we are working with colleagues at UCL to digitally restore historical parchments from The Great Parchment Book. Congratulations to Wenzel Jakob for winning the ETH/Marie Curie Fellowship for his postdoctoral research! Alec Jacobson will be awarded the ETH Medal for his PhD thesis, titled "Algorithms and Interfaces for Real-Time Deformation of 2D and 3D Shapes". Congratulations again, Dr. Jacobson! Olga Sorkine-Hornung wins the Intel Early Career Faculty Award. Daniel Cohen-Or is visiting IGL for a month. Yanir Kleiman and Oliver van Kaick from Tel Aviv University are visiting IGL for three months. We have three new SGP papers. The materials are now online. A free iOS app based on our Axis-Aligned Image Retargeting is out! It is called Refooormat, available on the AppStore for iPhone and iPad. Check out the ACM SIGGRAPH Technical Papers Preview! Around time 01:15 you can see snippets from two of our papers. Daniele Panozzo wins the 2013 EUROGRAPHICS Annual Award for Best PhD Thesis! Alec Jacobson successfully completed his PhD examination. Congratulations, Dr. Jacobson! We have five new SIGGRAPH papers. The materials are now online. Tino Weinkauf and David Günther visit IGL for the week. We have two new SIGGRAPH ASIA papers. The materials are now online. Sony visits the Institute of Visual Computing and IGL. Alec Jacobson wins the Intel Doctoral Student Honor Fellowship. Vizrt visits the Institute of Visual Computing and IGL. Olga Sorkine-Hornung wins the ETH Latsis Prize 2012. Leonardo Sacht (IMPA) joins IGL as a visiting PhD student and winner of a Swiss Government Excellence Scholarship. Olga Sorkine-Hornung is awarded the ERC Start-up Grant for the project "iModel: Intelligent Shape Modeling". Emily Whiting wins the ETH / COFUND Marie Curie Postdoctoral Fellowship. Our new SIGGRAPH paper materials are now online. New master and bachelor thesis projects posted! See our student projects page (available only within the ETH network). Our paper on axis-aligned deformations for image retargeting has been accepted to EUROGRAPHICS 2012. Peter Schroeder visits our group. Ladislav Kavan and Emily Whiting join IGL. Marco Tarini visits our group. cant impact on the game industry. We have three new SIGGRAPH ASIA papers, check out our publications webpage. Olga Diamanti and Daniele Panozzo join IGL. Olga Sorkine-Hornung receives the 2011 ACM SIGGRAPH Significant New Researcher Award. We have two new SIGGRAPH papers, check out our publications webpage.